FIGURE 1. Amplification plot (left) and regression curve (right) of a serial dilution of input DNA samples. Input DNA was prepared and purified from HCT 116 cells using SimpleChIP® Plus Enzymatic Chromatin IP Kit (Magnetic Beads) #9005. 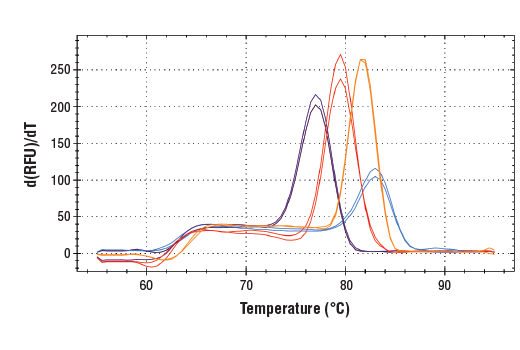 Quantitative PCR was performed with 20 (red line), 4 (orange line), 0.8 (purple line), and 0.016 ng (blue line) of input DNA and SimpleChIP® Human RPL30 Exon 3 Primers #7014. Data is shown for two replicates. FIGURE 2. Corresponding single melt peak of primers. Quantitative PCR was performed with input DNA sample from HCT 116 cells prepared by SimpleChIP® Plus Enzymatic Chromatin IP Kit (Magnetic Beads) #9005 and either SimpleChIP® Human α Satellite Repeat Primers #4486 (red line), SimpleChIP® Human RPL30 Exon 3 Primers #7014 (orange line), SimpleChIP® Human CaMK2D Intron 3 Primers #5111 (purple line), or human c-MYC promoter primers (blue line). Data for two replicates is shown for each primer set. FIGURE 3. Quantitation of ChIP DNA enriched using SimpleChIP® Plus Enzymatic Chromatin IP Kit (Magnetic Beads) #9005. 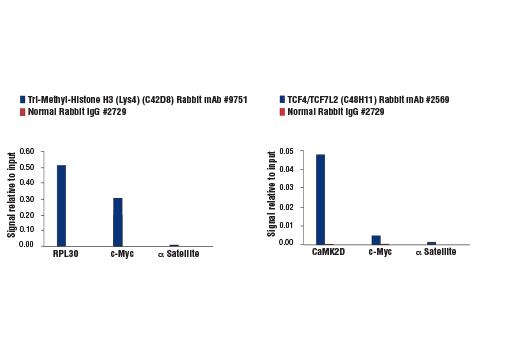 Chromatin immunoprecipitations were performed with cross-linked chromatin from 4 x 106 HCT 116 cells and Tri-Methyl-Histone H3 (Lys4) (C42D8) Rabbit mAb #9751 (left panel), TCF4/TCF7L2 (C48H11) Rabbit mAb #2569 (right panel), and Normal Rabbit IgG #2729 (both panels). The enriched DNA was quantified by real-time PCR using either SimpleChIP® Human RPL30 Exon 3 Primers #7014, human c-Myc promoter primers, SimpleChIP® Human CaMK2D Intron 3 Primers #5111, or SimpleChIP® Human α Satellite Repeat Primers #4486. The amount of immunoprecipitated DNA in each sample is represented as signal relative to the total amount of input chromatin, which is equivalent to one. The SimpleChIP® Universal qPCR Master Mix is an optimized 2X reaction mix for real-time qPCR detection and quantitation of target DNA sequences using the SYBR/FAM channel of most real-time qPCR instruments. It contains Hot Start Taq DNA Polymerase and has been formulated with a unique passive reference dye that is compatible across a variety of instrument platforms (including those that require a high or low ROX reference signal). It also features dUTP for carryover prevention and a non-fluorescent, visible dye to monitor reaction setup. This dye does not spectrally overlap with fluorescent dyes used for qPCR and will not interfere with real-time detection. This product is provided in 1 ml volumes sufficient for preparation of 100 qPCR reactions, and is compatible with both enzymatic and sonication-fragmented DNA samples from SimpleChIP® enzymatic and sonication ChIP kits. This master mix formulation is supplied at 2X concentration and contains all PCR components required for amplification and quantitation of DNA, except primers and a DNA template. This product is stable for 12 months when stored at -20°C and protected from light. It is stable for up to 30 freeze/thaw cycles and can be stored at 4°C, protected from light, for up to 1 month. 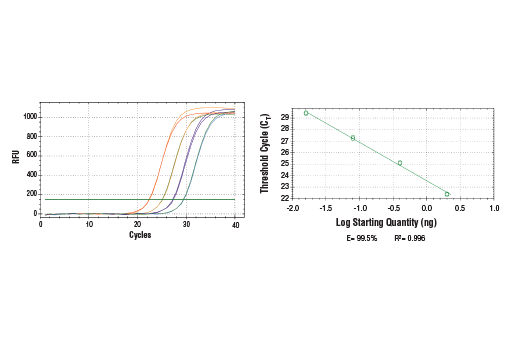 Dye-based quantitative PCR (qPCR) uses real-time fluorescence of a double-stranded DNA (dsDNA) binding dye, most commonly SYBR® Green I, to measure DNA amplification as it occurs during each cycle of PCR. At a point where the fluorescence signal is confidently detected over the background fluorescence, a quantification cycle, or CT value, can be determined. CT values can be used to evaluate relative target abundance between two or more samples, or to calculate absolute target quantities in reference to an appropriate standard curve, derived from a series of known dilutions. qPCR is commonly used to detect and quantify target genes in genomic DNA that is enriched by chromatin immunoprecipitation (ChIP).